The discussion of the meaning and interpretation of the first ten Amendments to the Constitution has become central to public discourse. But with unmediated news sources and fake news abounding, it is difficult to grapple with the issues without an unbiased guide. This series of books aims to inform the interested citizen of the Framers' ideas that underpin each amendment, along with their subsequent history, illustrated with easily accessible examples from popular culture. The first Amendment to the Constitution allows us to believe and say what we want. But rights and the rule of law are fragile things and the history, philosophy, argument and wrangling that it took to get to the First Amendment is a fascinating journey. From ancient times to the present via the classical period, Magna Carta, Martin Luther, the Pilgrim Fathers, libel laws and the thinking of the Framers, Robert McWhirter accompanies us employing a witty, light touch that manages to relate the arguments around the Amendment to its interpretation in popular culture and belies the deep scholarship and research that underpins the work. The book is an invaluable source for students of the history of the Constitution as well as providing an entertaining guide to the discussion around the intended meaning and subsequent interpretation of the First Amendment for the interested citizen. On the journey through time there are illuminating and surprising diversions into the history of literature, religion, film, sports and popular culture. 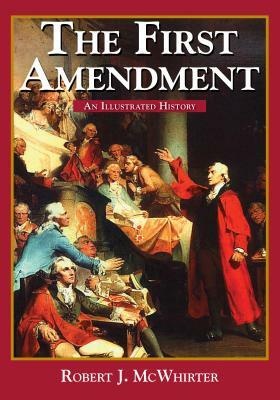 This book originally appeared as chapter one of Bills, Quills, and Stills: An Annotated, Illustrated, and Illuminated History of the Bill of Rights.